Osteoarthritis (OA), also called degenerative joint disease, is a slow destructive process of the joint affecting millions of people worldwide. Although the exact biochemical cause of OA remains unknown, the process usually begins when the joint structures are abnormal or the stress placed on the joint surfaces is unusually high. The secondary inflammation due to progressive articular destruction appears to be localized to the particular joint being affected. Current anti-inflammatory treatments for OA while providing some relief from symptoms are suboptimal and the side effects associated with these treatments; in particular the COX-2 specific NSAID's are becoming increasingly recognized [1, 2]. As a result of this, use of alternative treatments and complementary medicines are gaining popularity in the United States among OA sufferers. Glucosamine, a structural component of cartilage, is recognized as a nutritional supplement by the US FDA but as a pharmaceutical product in most European and Scandanavian countries as well as some Asian and Latin American Countries. Glucosamine has been the subject of many trials [3, 4] and is used worldwide as an "alternative" treatment for OA although the extent to which it may provide relief to the symptoms of OA is still unclear. The recent NIH funded Glucosamine/Chondroitin Arthritis Intervention Trial (GAIT) tested the efficacy of glucosamine in providing relief for subjects with symptomatic knee osteoarthritis . In this multi-centre study, glucosamine hydrochloride was tested either alone or in combination with chondroitin sulfate, a gycosaminoglycan that is also a structural component of cartilage and a popular alternative therapy for OA. 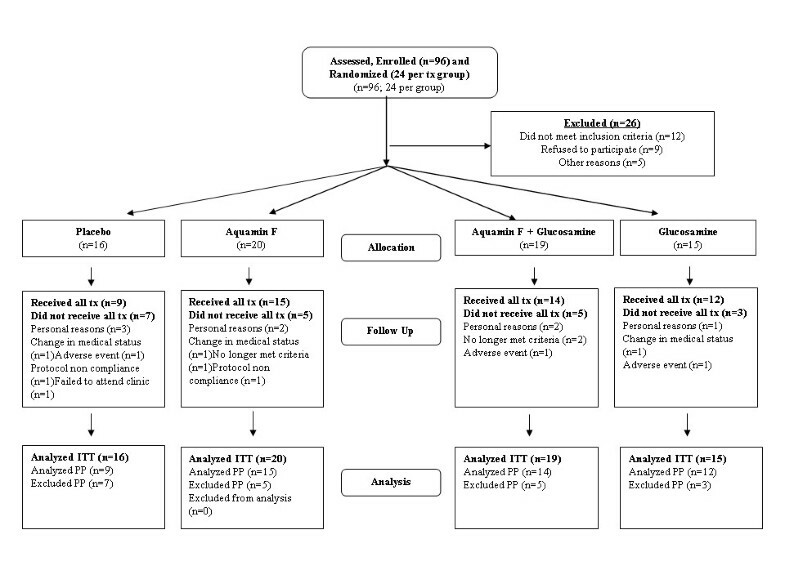 In this study, the overall group of subjects failed to demonstrate an improvement in symptoms for both the individual and combined treatments possibly as a result of the large (60%) placebo effect observed. Some benefit was observed in a subset of subjects with moderate to severe knee osteoarthritis suggesting that the benefits of these nutraceuticals may be limited to this group. In addition to glucosamine and chondroitin, other nutraceutical products have been reported to provide relief from OA [6–9]. Cat's claw extract has recently been combined with a mineral based treatment (Sierrasil®) to provide symptomatic relief for a group of mild to moderate OA sufferers. While initially demonstrating some benefit with the cats claw/mineral supplement, Miller and co-workers observed that this benefit was at best temporary for a 1–2 week period . Even though the positive effects were short lived in this subset of OA subjects, growing evidence suggests that minerals may play a role in joint health. Naturally occurring minerals such as magnesium, copper, manganese, selenium and zinc have shown anti-inflammatory effects in both animal and human studies. In a rat model of osteoarthritis, a deficiency of dietary magnesium was demonstrated to enhance the amount of cartilage damage . Furthermore, increased magnesium in the diet may influence inflammation through reducing the serum level of the pro-inflammatory protein C-reactive protein . The trace element copper is an essential cofactor in enzymes such as the collagen cross-linker lysyl oxidase and the anti-oxidant enzyme super oxide dismutase (SOD) that also requires zinc and manganese as cofactors. Recent evidence has suggested a role for oxidative stress in the pathogenesis of OA whereby an excess of reactive oxygen species arising from an imbalance in the antioxidant status of the joint (such as reduced levels of SOD) may result in cartilage degradation and joint remodeling . Selenium is also an essential co-factor for glutathione peroxidase may have a role in reducing the incidence of osteoarthritic lesion [14, 15] Positive roles have also been suggested for trace minerals such as boron and manganese in reducing the symptoms and slowing the pathogenesis of OA . **Aquamin contains a wide spectrum of trace minerals assimilated from sea water of which the minerals outlined in the remainder of the table are a selection. *Sig. = significance by within group paired t-test; 2-tailed; ANCOVA comparison between groups with baseline measure as covariate. # = ANCOVA comparison between groups showing any differences at baseline for these parameters. 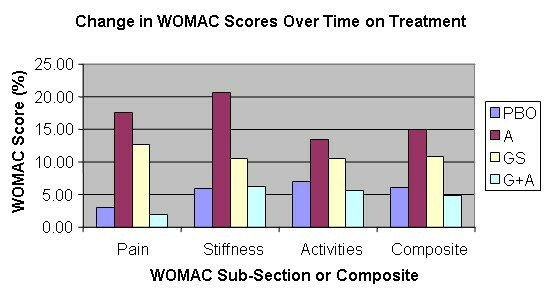 Percent change in WOMAC scores from baseline over 12 weeks of treatment. Changes in 6 MWD Between and Within Groups Over 12 weeks of treatment. Aquamin is composed of multiple minerals and the 'active ingredient' for the complex is difficult to determine. A number of the minerals in Aquamin may have anti-inflammatory and anti-oxidant properties which might directly and/or indirectly influence the efficacy of this unique complex [13, 14, 16]. While the prominent mineral present in Aquamin is calcium (dosage = 80% Ca U.S RDA), its role in joint health is unclear. Magnesium however, was given at the daily dosage providing 14% (male) to 18% (female) U.S. RDA  and over the course of this study, this increased consumption of magnesium may have influenced OA symptoms by affecting the utilization of calcium or by potentially reducing inflammation around the affected joint. Both manganese and selenium were given at the daily dosage providing up to 16% and 4% of their RDA respectfully. Both of these trace minerals have been reported to reduce the appearance of osteoarthritic lesions and reduce the severity of symptoms in OA [14, 16].